When I create in Native clay I feel a very strong connection to my heritage. Like so many Pueblo potters working today, I feel as though I’m fulfilling my grandmother’s legacy passing on the knowledge of Pueblo pottery. The beauty of Native culture in and around my life gives me inspiration to create art. 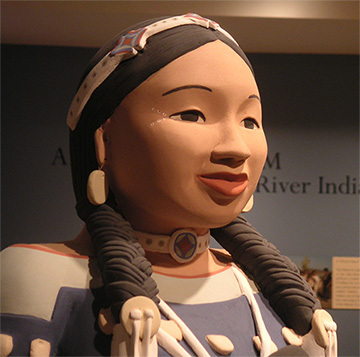 This inspiration is expressed by Native figures sculpted in clay that have a joyous quality in their faces. My work has been influenced by many Native cultures and different art mediums. Mixing Native clays with other materials has become a part of my installation work. By incorporating technology with tradition I feel as though I’m bringing two worlds together. I honor my people’s past by acknowledging Native people as they were and are today. My personal relationship with my art work starts with the intent of creating a full-circle cultural experience. I embrace the heritage of the people around me and absorb the knowledge that they have to offer. It begins with an emotional response, then a thought, which then becomes my finished piece, expressed through my eyes and hands. That very personal experience is passed on to others.